Every Thursday dozens of food trucks roll in to the paved lot next to the Startup Building in Provo. 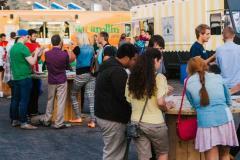 Come try out the many different food trucks and enjoy live bands and mingle with others. Rain, snow, or shine, the food truck roundup takes place all year long!